Raul Grosz, MD is an outstanding neurologist with over 25 years of healthcare experience. He is Board Certified in Neurology and is in private practice in South Florida since 1990. Dr. Grosz is a founder of AAA Neuroscience Consultants with offices located in Aventura and Miami Beach, Florida. Dr. Raul Grosz’s specialties include migraine headaches, memory loss, seizure disorders, Parkinson’s disease, carpal tunnel syndrome, neuropathy, pinched nerve, sciatica, and radiculopathy and treats all conditions of the nervous system. Appointments are available in Aventura and Miami Beach, Florida. You deserve first-class caring compassionate neurologic care. I take the time to listen to you and assess your needs. I then personally perform a hands-on specialized Neurologic examination using my 25 years of clinical experience to specifically look for signs of Neurologic involvement. We then developed a personalized diagnosis and treatment plan meeting your specific needs. I have access to state-of-the-art diagnostic facilities and maintain an excellent relationship with my medical colleagues. Choose me to help you now. I look forward to personally meeting you. Dr. Raul Grosz graduated with High Honors majoring in Biochemistry at the State University of New York at Stony Brook, thereafter completing his Medical Degree at the State University of New York at Buffalo. Raul Grosz, MD completed his Neurology training and Chief Residency in Neurology at the University of Miami, Jackson Memorial Hospital, and then finished his fellowship in Epilepsy, EEG, Evoked Potentials at the University of Miami, Jackson Memorial Hospital. 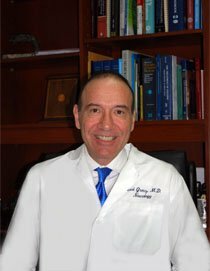 He is a member of the American Medical Association, American Academy of Neurology, Miami Dade County Medical Association and is in excellent standing with his colleagues. Raul Grosz, MD is a neurologist located in Aventura and Miami Beach, Florida. You can contact his office for an appointment at (305) 936-9393.